I woke up this morning with my arms wrapped around myself and tears on my face. In the distance I'd seen my elementary school best friend who I hadn't talked much with since I left that school over four years ago. It's been a tough, insanely challenging and stretching four years of growing up. I've felt anger almost to the point of hysteria while screaming in my grandma's bathroom because injustice burns, people lie, and people like to believe the lies sometimes. I've felt the hollow loneliness of never feeling like you have a place to just belong. I've felt the resounding slap of someone you had let get close literally disown your family. I've faced countless whys as I grapple with my own failures and struggle to deal with failures I feel have been committed by those around me. I've stared at the sky countless times and wondered what it would have been like if only ... If only I would have done something different. If only I would have gone to this one school. If only I would have not said that. If only she would have stood up for the truth. Yet, the girl from my past called out my name and came running towards me. She gave me the biggest, longest hug as we sunk to the floor and both started crying. We didn't speak, but even though we weren't using words, I was somehow unloading all the pain of the past years - frustration at myself and the world, obstacles that I didn't ask for, hurts I've battled - the growing up of the past four years that was unknowingly compacted in me. Tears where the thread that slid through my dreams into my reality. 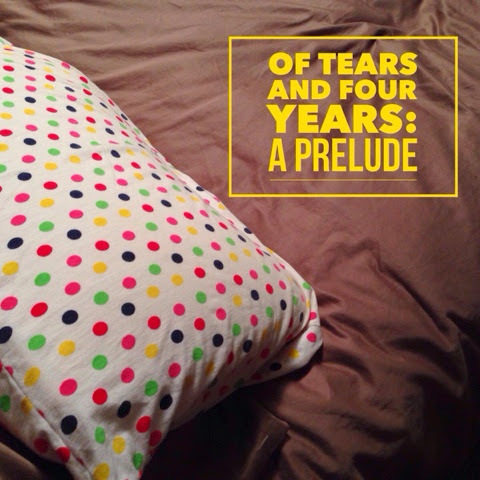 I slowly came out of the dream and found myself back in my room with the tears reaching my polka-dotted pillow case. I reacquainted myself with reality through a bowl of spaggetti-os and fumbled to resume life. My ACT scores had come in; I worked out some VBS details with a friend; I pulled out my old to-do list leftover from the school year and sorted through papers demanding attention. But the heavy somberness of the dream has persisted like the heat of the summer sun that won't leave lingering your skin. The tears. The fears. The whys. The pain. The confusion. I haven't had a particularly hard life, I'd say, but life itself is hard enough for everyone. These past four years have left me battered and broken beyond what I sometimes believe to be beneficial. But, somehow, that's the beauty of it - everything that I look back at with regret, that which nags and frustrates me, the circumstances I cannot understand the full meaning of - that's the very things that. God. gave. me. He had a purpose for placing me in every situation. He knew what I'd experience and new the growth that would come. Every one of my "whys" are His "I"s - where He speaks "I AM, Deborah, even when you've failed, even when you don't understand." and all I can do is surrender this sloppy, broken mess to Him and choose to trust Him - to trust that He makes beauty in the broken and to focus on Him, the source of all beauty. Because even when I just don't understand, when I wish I would have been different or circumstances were different - He is. As plain and basic as that sounds, the impact of that simplicity is striking. ... And, all that I wish four-year-ago Deborah would have not only realized but also believed? Those lessons have found their voice. Check out the two blog post they debut in by clicking here and here. Spiritually this article has a depth! God leads us in places like desert and valley! To make us more like him! I pray sincerely that you would shine for him!